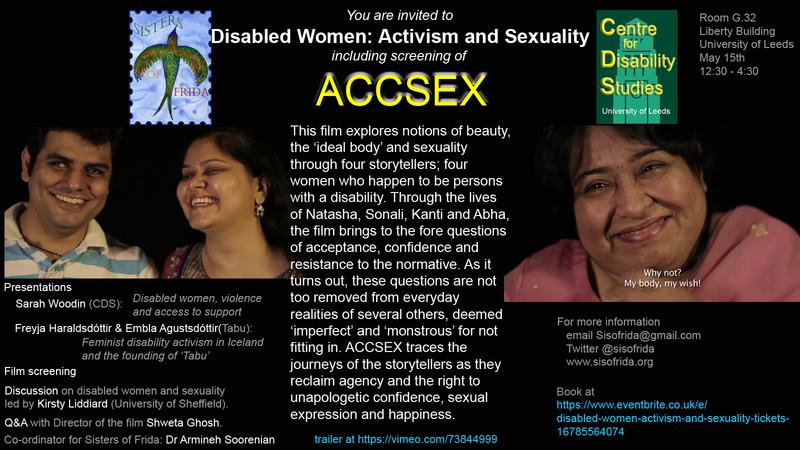 The second part (after a short lunch-break will include: A screening by Sisters of Frida of the film, ‘ACCSEX’ – which explores notions of ‘ideal bodies’ (https://vimeo.com/73844999); and discussion led by Kirsty Liddiard (University of Sheffield) and Q&A with Shweta Ghosh (director of the film). Teas and coffees will be provided but please bring your own lunch. The Liberty Building is number 16 on the campus map. How to get to the University. There is limited car-parking available on campus on a first come, first serve basis with a charge of £5.00. Parking spaces are available on campus for blue badge holders. Please contact 0113 343 5491 or [email protected] for further details. Are non-women welcome to this event? I believe it is open to all at CDS.